Description: Most people say sewing is a lost art. But with the Brother se400 Computerized Embroidery and Sewing Machine it’s not. Learn more about this sewing machine in this review and find out why it has been the #1 selling embroidery machine on Amazon . This Brother sewing machine model and embroidery machine provides a wide range of features such as 98 stitching functions and an array of sewing stitches, all 67 of them. With these features, you can make elegant décor for your home, attractive apparel, and memorable gifts for your family and loved ones with its four inches by four inches hooping capability for exquisite embroidery. Embroidery area: with a spacious 4” x 4” work space, you have all the freedom to be freely creative with whatever you wish to design. Backlit LCD with touch screen display: access the plethora of this machine’s built-in designs, control how these designs are made or edit them according to your preference, and learn from tutorials through the clear LCD display for your visual comfort. Well-illuminated needle area: you need no task lights or additional lighting to enable you to see the needle area up close because of the brilliant lighting that is focused on the machine’s needle area. Automatic needle threader: you can retire your magnifying glass and use your tweezers exclusively for your brows because of the automatic needle threader in this machine. One touch is all you need for the machine to thread itself. Convenient bobbin preparation: the se400 will quickly prepare your bobbins for you with its winding system to make it for you to thread. Computer connectivity: with this kind of connectivity, you can conveniently and easily download updates and import designs on your sewing machine because it uses standardized files for digital designing and embroidery files that are readily available after purchase. Drop-in bobbin: you can say goodbye to bobbin thread “fishing” because of the drop-in, jam-resistant top bobbin system of this model. Assorted Accessories: your purchase comes with a wide array of assorted accessories that includes an embroidery arm, a 4” x 4” hoop for embroidery, bilingual operational manual written in both English and Spanish, and various accessory feet for monogramming, embroidery, buttonhole, zipper, blind stitching, button-fitting, and overcastting. Accessory bag: contains scissors, three bobbins, a touch pen, cleaning brush, two screwdrivers, three spool caps, seam ripper, and a needle set. Five font types for monogramming. LCD panel has a back light. 120 combinations of frame patterns. Equipped with presser feet that snap on. Horizontal thread system has a push-button cutter. Capable of free arm sewing. Price: this is a value-for-your-money purchase that is surprisingly affordable for the many features it offers. Designs: the built-in embroidery feature of the Brother se400 embroidery machine provides 70 of attractive floral, animal, kids’, and holiday designs. Bobbin: there can be no easier bobbin system to wind threads with than this. Tutorials: these teaching aids are extremely helpful to first-timers in the challenging world of sewing and embroidery because they show you how to use the functions displayed on the touch screen of the LCD. Automatic needle threading mechanism: you don’t need glasses to thread needles anymore because this function is automatic with this particular Brother sewing machine. The only shortcoming – if it can be called that – of this machine is its singular and small embroidery hoop that can be restricting when comes to designs that go beyond the 4” x 4” measurement. While reading Brother se400 reviews around the web, you’ll quickly realize that this machine’s customer’s are overwhelmingly satisfied. Most people consider it the most fully loaded and completely equipped sewing machine available in that price range. This is understandable since it is an embroidery/sewing combo machine. 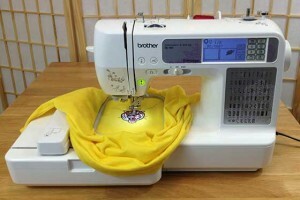 I would consider this sewing machine to be an excellent choice for home entrepreneurs and hobbyists alike. There are a lot of great features to be found here and if you are at all interested in embroidery as well then you will be thrilled with this machine. Both professional and beginner sewing enthusiasts should have no trouble getting to know this machine quickly. I found it super easy to use and I think most others will too. Since it is such a popular machine you will also find lots of helpful videos on YouTube that will give you even more support while getting up to speed. I noticed that most customer reviews of this sewing machine were extremely satisfied and that speaks volumes. If you want to embroider and don’t already have a sewing machine then this is a simple and excellent choice for you. I had a lot of fun trying this machine out and think that you will love it too. 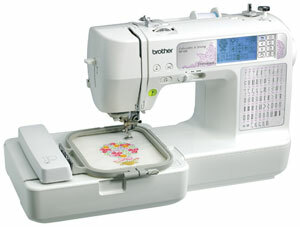 If you are unsure or already have a sewing machine you love so only want an embroidery-only machine you should take a look at the Brother SE770 found on this page. It has more features and a larger embroidery to work in. Hi Mary, I believe they do come pre-loaded with designs. There is extra room for you to add your own if you wish to, but you don’t have to.